Product Photographer Craig Wagner Time for a Dip! | Studio 3, Inc. Product Photographer Craig Wagner Time for a Dip! Product Photographer Craig Wagner puts his creative skills to use for our client Nixon. Utilizing natural elements to add drama and movement brings these watch images to life. Read below for a few words from Craig! This photo shoot required a lot of teamwork and was a problem solver’s dream. It was obvious that digital art would be needed but I chose to capture as much as we could in camera giving the final image a surreal look. 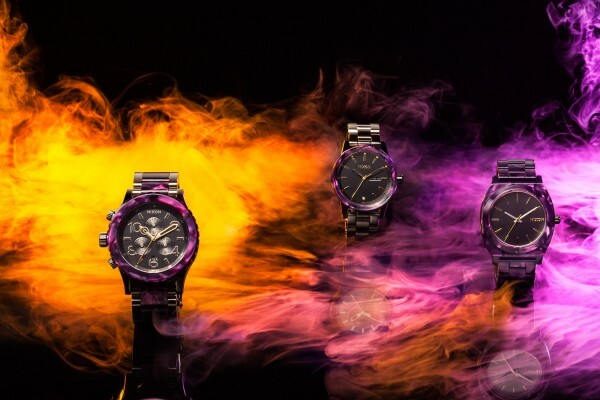 For the first image of the Nixon Dip Dye collection we utilized the Profoto Pro-8a 2400 power packs for their high flash duration to capture the water splashes and their impressive recycle time to capture the floating colored dyes. Studio3’s custom made “Time-Delay” triggering device allowed us to precisely control the amount and height of each splash. Managing the colored dye proved to be the real creative challenge on this shoot. Our studio producer rounded up a variety of colored powdered pigments and dyes to suspend in the water. We were surprised to find that regular kitchen food coloring provided us the results we were after. To get the right amount of movement of the dye we used a 33 gallon tank which allowed us enough water space to create just the right current. The second image below of the Nixon Velvet collection was shot on black plexiglass utilizing our Roscoe smoke machine. which we love to pull off the shelf and add into many of our fun creative shoots. Finding that the smoke was a big challenge to manage its direction and flow on such a small set, we turned to dry-ice which provided a smaller much more controllable amount of vapor flow. Adding colored gels to our strobes really made the smoke stand out and added a lot of movement to the overall image. 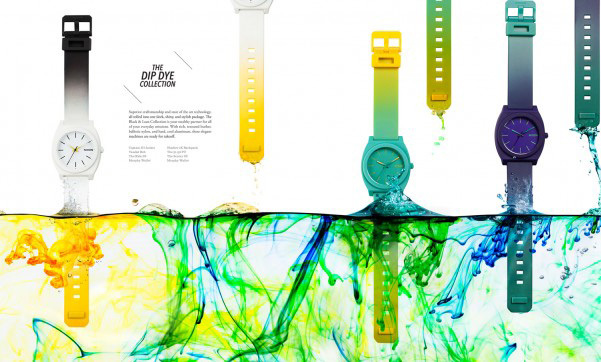 Nixon’s creative team was great to work with. They had a (tight) solid concept but were very open to experimentation and my team’s input. This shoot gave us the opportunity to play with some new equipment, pull some of our fun gadgets off the shelves and exercise our creativity to bring these Nixon watches to life! To view these on the Nixon website click here! Get Your High Beams On!